My friends tell me I talk too much. They reckon I never shut up, especially on a Grand Prix weekend. I'll come out with a random fact about the sport which, quite frankly, they didn't really want to know before and are none the wiser for having discovered. Once the race is actually over I will relive and discuss the whole thing until the sun goes down, the cows come home and I find that I'm actually talking to myself. This weekend, however, they were honestly baffled by my complete lack of emotion or comment. For one of the first times I can remember I was totally lost for words. The Austrian Grand Prix had just come to its farcical conclusion and I sat in my front room completely speechless. My mobile phone rang out the sound of half a dozen text messages arriving and they all said the same thing. "What did you make of all that then mate?" and I had no idea how to reply. What words to use? Dumbfounded, disgusted, shocked, angry and sick were a few that managed to ease their way past the combination of confusion and blind rage that filled my head. I love Ferrari. Like many fans of the sport I was taken in at an early stage of my life by the image of the beautiful scarlet cars flying majestically around the race tracks of the world. Living in England, a country ruled by soccer, many of my friends could not grasp the fact that I felt the same emotions when a Ferrari crossed the line in first place as they did watching Manchester United (or whoever their team might be) absolutely battering the opposition. I always explained that the history, the passion, the emotion and the loyalty were precisely the same. With Ferrari, as with a soccer team, it is the team and not the individual that one supports. Drivers come and go and a Ferrari driver will always hold the respect of the Ferrari fans just as soccer players will often hold special memories for fans years after they have been transferred to a different team. Just a few years ago in the UK many well known soccer stars were found guilty of "match-fixing". This scandal rocked not only the sport but the fans which followed it. For the fans to discover that the show they watched was not a fair sporting occasion but an event where the result had been pre-decided made them furious. One of the text messages I received on Sunday brought up the question of "race-fixing" and it was something I'd never considered. Nobody who knows the sport could possibly entertain the notion that the Ferrari management are applying team-orders as part of a huge betting scandal, but you can see how bad it looks to somebody who doesn't really follow the sport. At a time when the sport needs all the friends it can get, Ferrari's actions in Austria will undoubtedly have pushed some of them away. It was obvious from Michael Schumacher's demeanor after the race that he was less than happy with the situation. 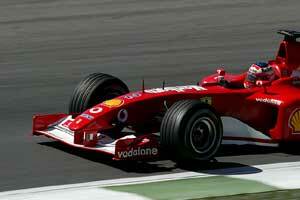 Schumacher is a racer and to win a record-equalling fifth title from handouts will give the man no satisfaction. It was very telling that he said he wished this World Championship over as soon as possible so that he could get some racing done. But, as he pointed out, this is the way that Ferrari want things done and he can't argue. In 2001 I was a guest of Ferrari's at the Tutti le Ferrari weekend at Monza. After a display of some of the greatest scarlet cars that have ever graced a Formula 1 grid I managed to buy a watercolor montage of some of the cars I'd just seen driving in anger around the spiritual home of Italian motorsport. Just looking at it fills my head with images of an era of the sport I never knew. Jody Scheckter's 1979 title came two years before I was born. As I said, I love Ferrari. I love the passion the team ignites in me and I love the fact that the sight of those shiny red cars spawned my love for this sport, its past and its future. Surely then, I should be able to find some words to describe how I felt on Sunday? As I looked at Barrichello's broken face, all I could feel was sympathy for a man who does not deserve to be treated as an expendable tool. When Ross Brawn was interviewed, my sympathy turned to an all-encompassing rage as it transpired that he had no emotions over the decision whatsoever. When Brawn insinuated that the sport wasn't about racing anyway, I almost put my foot through the television. How could this man, one of the focal points of the team for the fans, be so out of touch with the history, morality and emotion of the sport we all adore? The Austrian Grand Prix had filled me with almost every emotion I knew. As I tried to find the right word to tell my friends what I thought of the whole sordid affair I looked at my Ferrari watercolor which hangs, in pride of place, in my bedroom. Yes, I was upset. Yes, I was angry. But as I searched for answers in a desperately uncertain future and a history I never knew I was left with but one simple word.